Chart of the Day: Who’s Afraid of Chris Matthews? 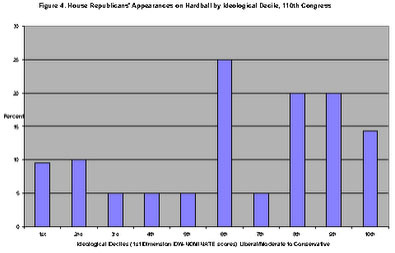 Seth Masket passes along a chart today showing which members of Congress are most likely to appear on Hardball. Among Democrats, it turns out that liberals and moderates are about equally likely to appear. Among Republicans, conservatives appear all the time but moderates are nearly absent. Why? Hell if I know. But if I had to guess, I’d say that moderate Republicans have so little influence that there’s no point in talking to them. Second guess: moderate Republicans are boring, so Chris Matthews is uninterested in them. He’d rather book fire-breathers that he can mock. Third guess: moderate Republicans usually don’t have safe seats and figure that appearing on a liberal chat show is a lose-lose proposition for them.